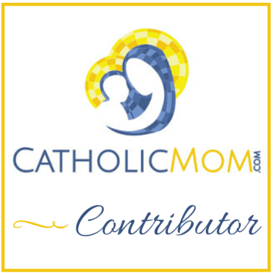 meaningful mondays: school family dance! For 13 years now we’ve been gathering canned goods each November to gain entrance into our elementary school’s fall family dance. It’s always very noisy and energy filled. The kids come dressed in themed attired. This year’s theme? Neon! 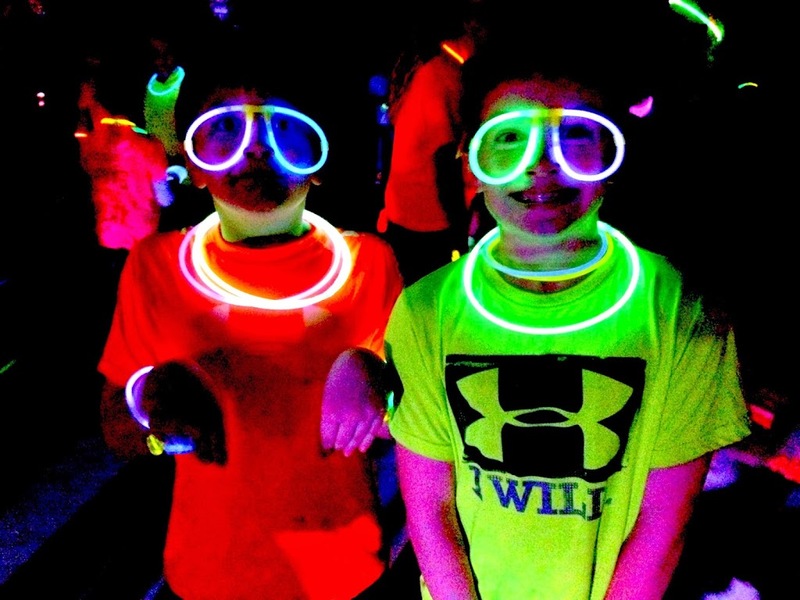 My son and his friend came equipped with neon goggles thanks to Joey’s mama. They danced until sweat beads were running down their temples and dripping onto their shirts. I still remember when the song “YMCA” by the Village People hit the radio waves. Who knew all those years ago that it would still be fun to stay at the YMCA in 2014? If for some strange reason amnesia has erased this fine song from your memory, “there’s no need to feel down”…here you go! Our sixth-grader has graduated from elementary, and often laments over the simpler days of yore. I encouraged him to come to the dance with me, “for old times sake.” He did, and I think this pretty much fixed his pining inclinations. After a while of wandering around with a couple of his pals, he decided he was too old for this nonsense, and sat with me on the sidelines, spinning a neon bracelet. 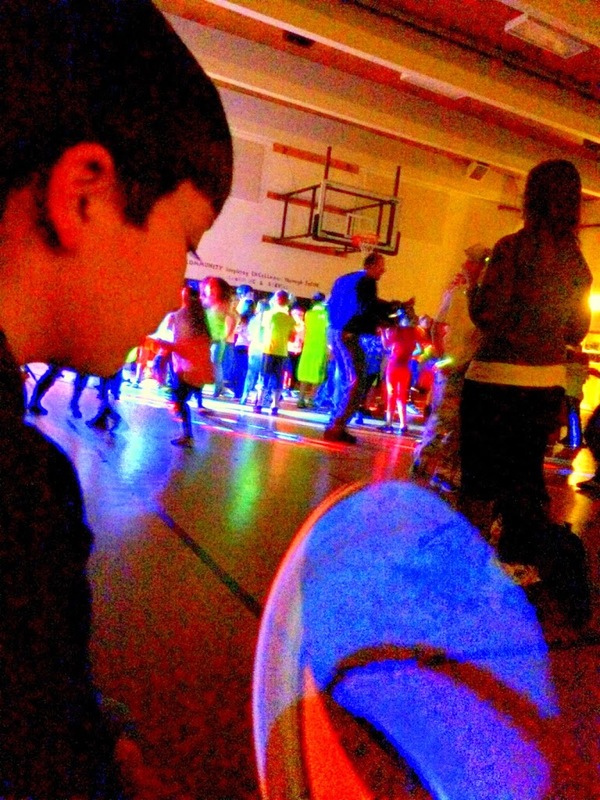 One of the highlights of every fall family dance is the d.j. 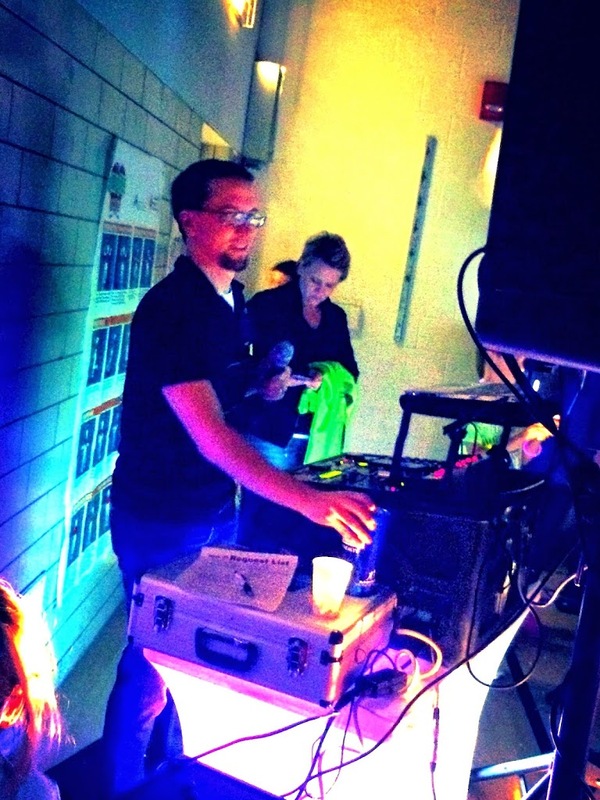 Nate Callens has been providing music for this event for 11 years now. He has a way of making it super fun for the kids. There are very few who are hanging on the walls. Most are out there on the dance floor most of the duration, and it’s a lot because of Nate’s fun presence, I’m sure of it. At one point, I took a bathroom break, and while wandering the halls of the school, noticed the adorable artwork coloring the walls. 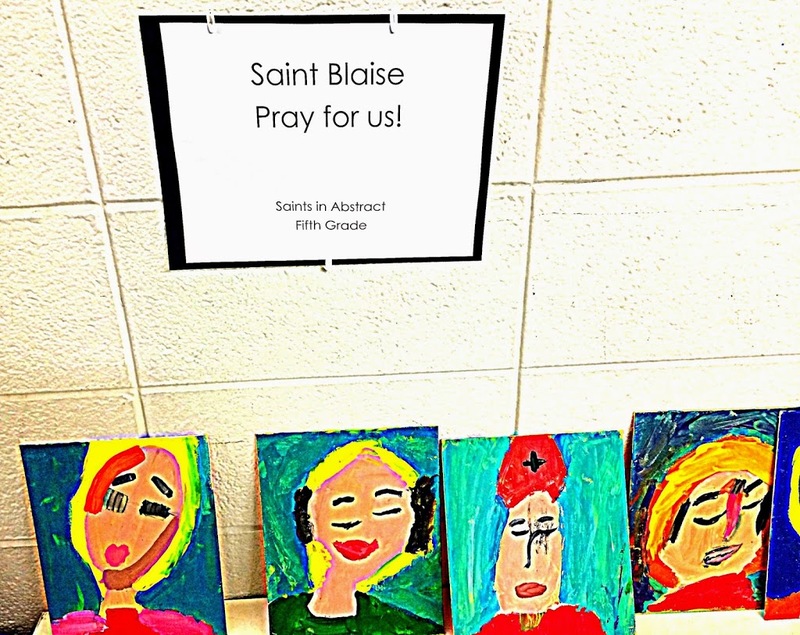 Each class chose a saint to depict “in abstract.” So many of my favorites were represented, but I had to take a photo of this one to share with my friend, Blaise, husband of Karen of the Flannery brigade from this summer. Isn’t Blaise a cool name? If I were to have another son, I’d cast a vote to name him Blaise. Our fabulous art teacher, Jean Eppler, is doing amazing work with the kids, from what the halls attest. 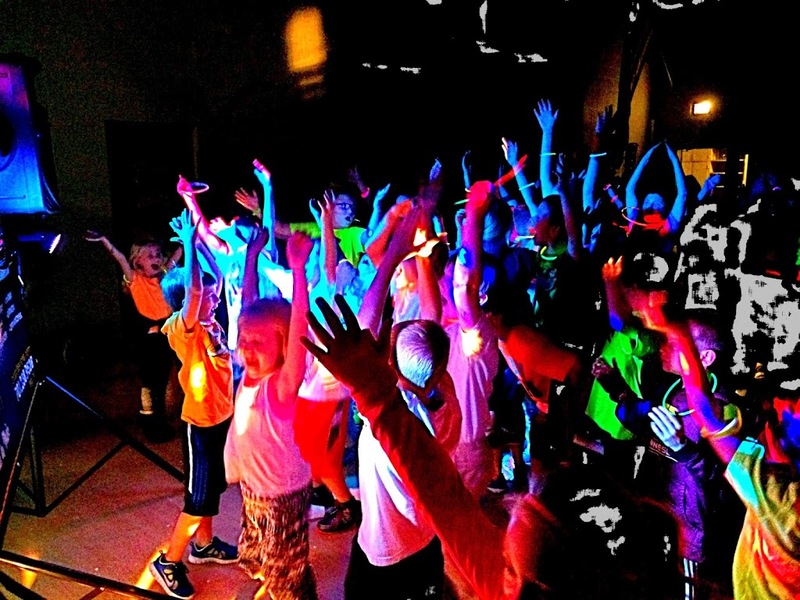 Q4U: What memories does the YMCA song bring back for you? Oh gosh- always just joyous, happy occasions of dancing and goofing around. We still do when its played at hockey games- and its fun that its trickled down to our own kids 🙂 So fun to hear about the dance and the fun!